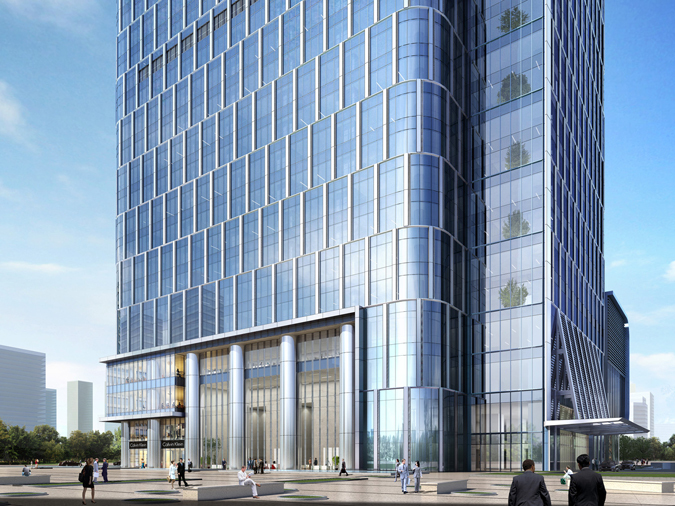 The office entrance on the tower's north side faces a broad pedestrian plaza. the structure's six-cell core steps back as the tower rises to two cells at the crown. The 2-foot-deep, 184-foot-high facade layer of this mixed-use tower in Tokyo designed by Peter Marino Architect shades the interior during the day and illuminates the neighborhood at night. 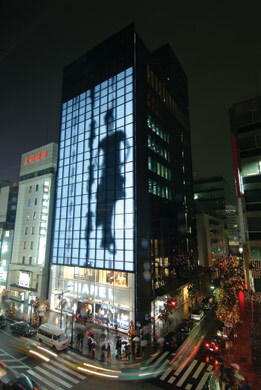 A layer of 700,000 computer-controlled LEDs transforms the facade into a giant pixelated screen displaying artist-commissioned imagery and live videos. 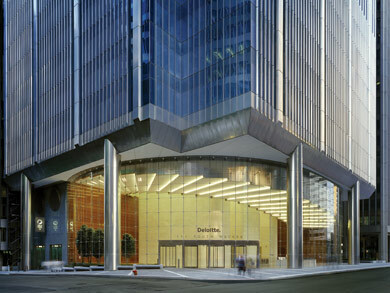 Cosentini worked with Lohan Caprile Goettsch Architects on the curving curtain wall that encloses the lobby of 111 South Wacker Drive. A dramatic spiraling ceiling wraps around a marble-walled elevator core and is accentuated with recessed fluorescents and suspended tungsten lamps. The lobby's low energy needs earned it an LEED gold rating. The lighting design of this San Francisco restaurant gives diners the experience of a sunset with changing neon lights in a large dome in the room's center. Rings of yellow, orange, and magenta are activated and intensified. 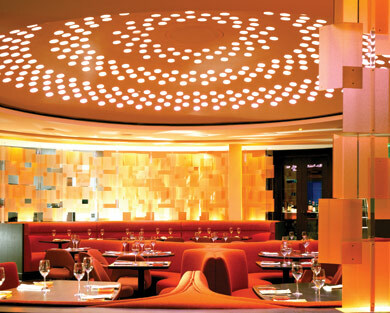 A similarly intense colored lighting palette draws diners to the restaurant's bar area later in the night. Energy-efficient dimmable fluorescent lights brighten up this ultra-white windowless Chelsea gallery. According to juror Mustafa Abadan, The architecture and lighting reinforce each other so seamlessly that it is hard to see where one ends and the other begins.. The jurors voted unanimously for Tod Williams Billie Tsien Architects' Robin Hood Library for its simple and playful lighting design. 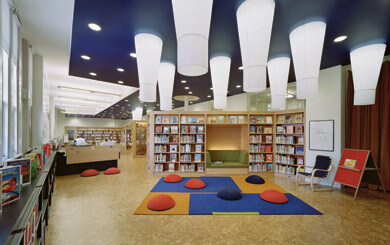 Juror Dan Jacoby praised its success despite a small budget; designers used low-energy fluorescents in a mix of dropped ceiling fixtures and recessed lights to create a starry ceiling. 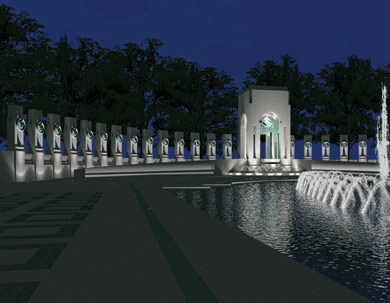 For the National World War II Memorial designed Friedrich St. Florian, Horton Lees Brogden created a lighting plan that highlights important elements of the memorial without interfering with surrounding monuments. The lighting design of Skidmore, Owings & Merrill's new terminal was created to help passengers navigate through the space. 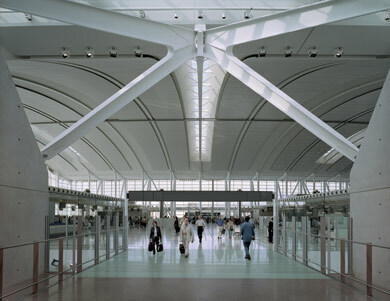 Skylights in the departures hall express a passenger's path; uplights in the baggage claim area reduce brightness and glare; downlights in seating areas provides light that's comfortable to read by. 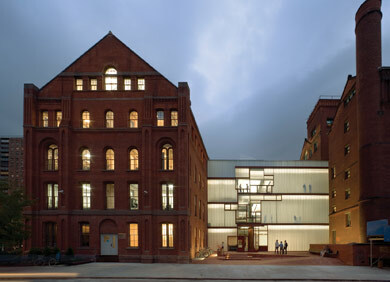 Juror Mustafa Abadan noted that the lighting of Steven Holl Architects' addition to Pratt Institute's School of Architecture is extremely delicate within the structuree and not overdone. To emphasize the project's minimalist aesthetic, all hardware and power is hidden within the pre-cast concrete structure and no exposed conduits were allowed. For Beyer Blinder Belle's conversion of a 1989 cinema multiplex into a five-theater, off-Broadway complex in 2005, atheatrical lighting scheme was paramount. 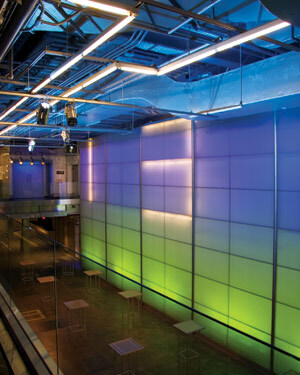 Colorful incandescents bounce off brushed metal surfaces while fluorescent bulbs form the number of each theater along the main corridor. 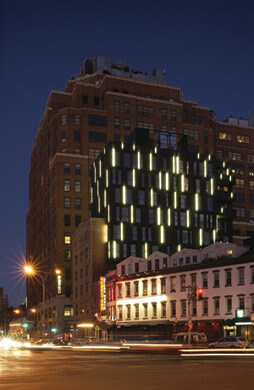 The striking appearance of New Yorkkbased SHoP Architects' Porter House owes much to its lighting design: Powerful fluorescents behind thin strips of opaline acrylic panels give the addition to the 1905 factory the appearance of a digitized DNA-sequence.